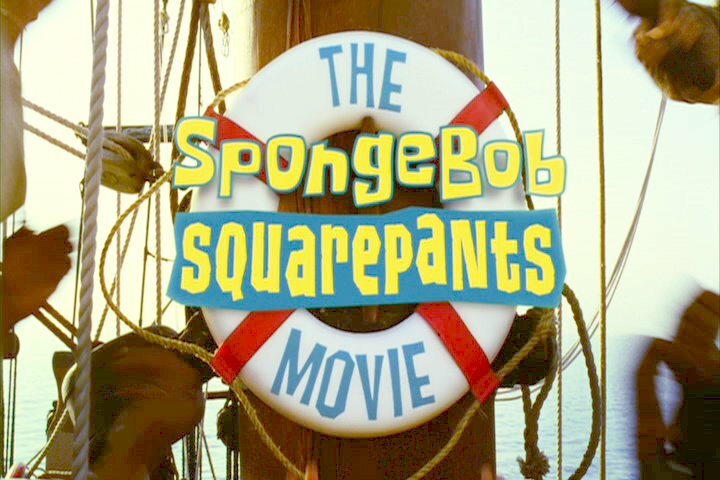 Whether you're a fan of the cartoon Spongebob Squarepants or not, you should check out the movie for a few minutes of silliness aboard HMS BOUNTY. Quite a bit of time and effort was spent on the ship to make the beginning three minutes or so of the film. In my opinion, it didn't contribute anything to the story line, but it provided work for the ship and some much-needed cash for the crew. The opening scene of the movie has BOUNTY anchored (by the stern? ), awaiting a dinghy being rowed by a lone pirate, with a treasure chest. Notice the crow's nest, constructed by the film crew especially for the movie. It was made of styrofoam. Of course, BOUNTY doesn't usually have a crow's nest, and it was taken down after filming. The pirates on BOUNTY go through an energetic (and ridiculous) dance number. For the closeups the regular actors performed at the pier in St. Pete. The motion of the ship, water, background, etc., was added in editing. For the distance shots, taken from a helicopter, the ship's crew dressed in the pirate costumes and cavorted on deck with mops, etc. Due to restrictions on the number of passengers allowed while underway, the entire film company could not sail with the ship. 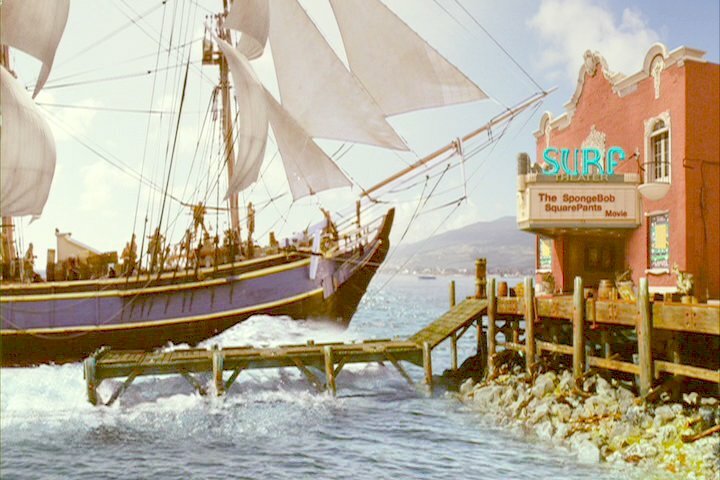 The most amusing portrayal of BOUNTY's sailing abilities comes when the pirates arrive at the movie theatre. Don't ask me WHY there is a theatre adjacent to a pier - just believe. What is unbelievable is the planing-hull powerboat ride they approach with, and the sudden stop they make when docking. Did I say docking? They don't actually dock, or furl the sails, either. They just arrive, screech(?) to a stop, and pile ashore. That's not quite the BOUNTY I know, but hey, it's a kids' movie, and it is rather amusing. Yes, the BOUNTY has sails, and yes, we use them. They don't look like this, though, even when the wind is dead astern and we've trimmed them carefully. 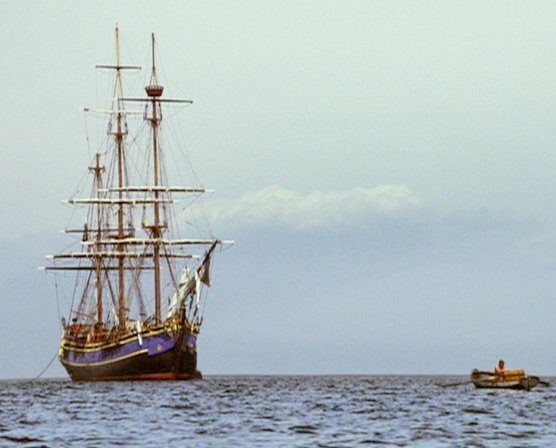 For this scene the sails were aback because we were using the engines, so the movie magic people corrected it with CGI. Pretty, though, eh?